Personal injury can happen to anyone. Among the most common causes of personal injury are car and motorcycle accidents, slips and falls, and defective products. While many of us default to an “it won’t happen to me” mindset, the very nature of these incidents being “accidents” means they are unpredictable and therefore have the potential to affect us all. Some preventative measures can be taken to decrease one’s chances of experiencing personal injury. Such actions include observing and obeying traffic laws and practicing proactive rather than strictly reactive driving; wearing bright or reflective clothing when walking or cycling in traffic areas; wearing appropriate footwear to suit various weather and walking conditions; taking note of one’s physical surroundings and observing potential hazards such as spills or poor lighting; and exercising caution in alcohol-fueled situations in which violent acts are more likely to occur. That being said, proactive behaviours are not a foolproof defense against personal injury. Recent examples of personal injury in Cambridge span a wide spectrum. A 45-year-old woman recently sustained life-threatening injuries when her motorcycle was struck by a pickup truck just south of Cambridge. An assault outside a Burger King in nearby Waterloo left a 24-year-old man with non-life-threatening injuries. A young man from Kitchener exited his vehicle after being rear-ended when the offending driver suddenly took off, trapping the victim between the two vehicles and causing severe bruising to his legs. Several Ontarians filed claims against a testosterone replacement therapy provider for failing to warn customers of increased cardiovascular risks. Personal injury, in addition to physical suffering, can affect one’s ability to earn income, keep up with household tasks and expenses, care for oneself and dependents, and receive satisfaction from life at a level comparable to before the accident. The psychological ramifications of personal injury and the subsequent changes to one’s everyday existence are not to be ignored, either. As though an injury and its continuing consequences are not agony enough, negotiating the complexities of an insurance claim often cause more headache than healing. Many victims of personal injury do not receive the full compensation to which they are entitled simply because they lack the necessary knowledge of claims proceedings. For these reasons, hiring a personal injury lawyer to represent an injured party expedites the claims process and typically results in speedier, more substantial compensation. The lawyers at the Injury Lawyers of Ontario (ILO) in Cambridge are experienced in handling a diverse range of personal injury claims. 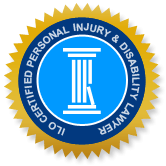 Our areas of practice include car and motorcycle accidents, automobile accident benefits, catastrophic injury, product liability, brain and spinal cord injury, disability claims, slip and fall injury, and wrongful death. Working with only the most trusted firms in Cambridge and across Ontario, the ILO group uses our collective expertise to ensure those suffering from personal injury receive their deserved compensation in full.